rave7™ is not just about being a great CMS. It's a solution that empowers you to service your customers in new and exciting ways helping you to grow your business. 100% web based. Use our hosting service or install it on your server. It's accessible from any internet-enabled computer anywhere in the world by or your customers. Content Management, Contact Management, Marketing, Help Desk, Order Management, Calendar/Training Management, Project Management plus many more. Choose the modules you need. rave7™ was built from the ground up with customization in mind. We dare you to find a more customizable system. Forms, table layouts, the database it's all 100% customizable. From future to current needs, rave7™ is a system that will grow with you year after year. CMS, Help Desk, CRM are the major modules. But you also enjoy calendar/training management, reporting, asset management, order processing, project management and more. 24/7 Customer Self-Service allows you to save on administration costs. Pricing matches your workload requirements because it's scalable and based on the number of concurrent users. Use security to grant edit rights of a specific page to a specific person. You can also allow specified people to edit a page and all it's sub-pages. There's no programming required, but you can use your ColdFusion skills to enhance the system. Pages can include rich content like images and flash. Reuse content. You can create a page once and use it in other locations. You can create and include surveys. You can create any number of forms with our form designer. They can be contact us forms, registration forms etc. Any type of form can be created and instantly added to any web page. Visitors/Members can register for access to the web site's member only services. Once they submit the registration form, you can accept or reject the registration. Includes a shopping cart with checkout to PayPal with a product database. Create pages that require the person to be logged into the site. Unlimited form creation like contact us/feedback etc. rave7™ is 100% Web based so there's no software to install on the end-user's computer. rave7™ allows you to edit Web content without having to know HTML. rave7™ uses the best-in-class page caching to optimize the retrieval of web pages from the database. You can create a page once and then reuse it in any other location in the web site. Once you upload some images to the media manager, you can edit your images directly online. You can use it to re-size, crop, rotate, fade, apply effects, use layers etc. Now you don't have to keep going back to your local editor, makes changes, and re-upload your images! Your domain name is the address people type into their browser to view your website. You'll get a free alias domain name from us, for example, yourname.rave7.net. You can also register a new domain, or use an existing domain name you already own. We will help you point any domain you already have to your rave7™ site. Tell your story by using our world class blogging platform. Easily add new posts, approve or delete comments, and use our widget tool to visually add/delete/re-arrange widgets from the blog sidebar. You can create private areas of your web site based on the type of user or other group classifications. You can also restrict the users web access based on having a valid service agreement for a given product. This is a great feature for providing access to secured resources to customers who have a valid service agreement. You can show off your photos in beautiful galleries and slideshows, and it's real easy. Just upload some photos into our media manager and you'll be ready to go. You can use some great transition effects as well like fade in, slide in, all kinds of animations and all without using flash. And if you know a little about CSS, you can further customize the look of the galleries. Add videos to your site from virtually any online vide site like YouTube, Vimo etc, as well as audio. It's real easy and you can also upload your own videos and add them to your pages as well. Reorder the pages in a menu at any time, or re-locate a page to another area of the web site. 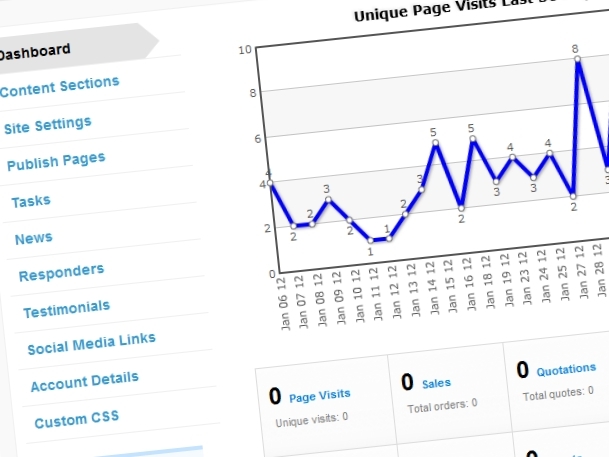 You can also create pages that require the user to be logged into the site before it can be viewed. You can also create page that required the user to have a valid service agreement for a selected product before they can view the page. You can save a web page to a staging area that allows you to work on a web page for a while prior to making it current. Meanwhile your users will see the last current version of the web page. You can also stage your website templates. Your rave7™ site will be hosted on our rock solid tier 1 datacenter infrastructure. It's climate controlled, has redundant power, and secure, and has 24 hour network operations support.